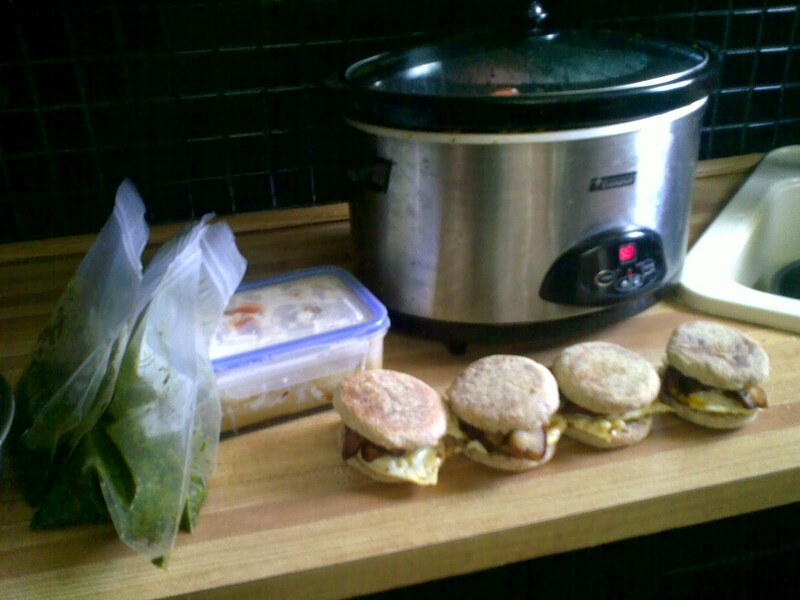 Another week started and meals prepared are obviously going to be the key. My wee one has her first cold so I was off today but she’s turned around tonight (even has a new tooth) and since she is breathing well, eating well etc. we’re going to try to not get up with her in the night (okay, I’ll sneak into her room but I won’t pick her up). This means I am a day behind at work and am I ever glad I spent a bit of time on Sunday cooking. We’re going to need yummy things but in a hurry. 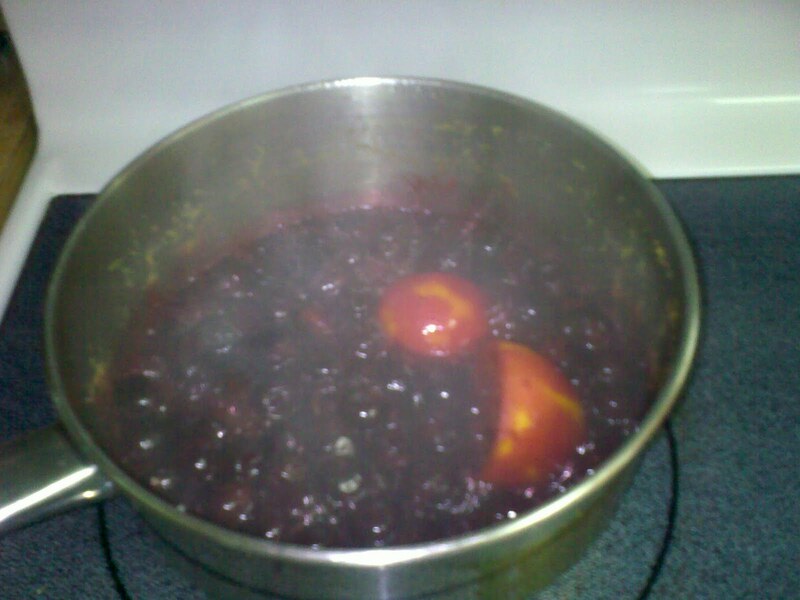 My neighbour gave me some lovely plums off of their tree and I couldn’t resist making a sauce out of them. Just boil up about 3 cups of plums with 3/4 cup of sugar, a shot of grand marnier and a lemon zested then just cut into halves and tossed in. I made a simple yellow cake (see previous recipe) and the two were a match made in heaven. I’ll apologize again about the pictures. My friends have said I need to put away the blackberry but it is so much easier and is always handy. 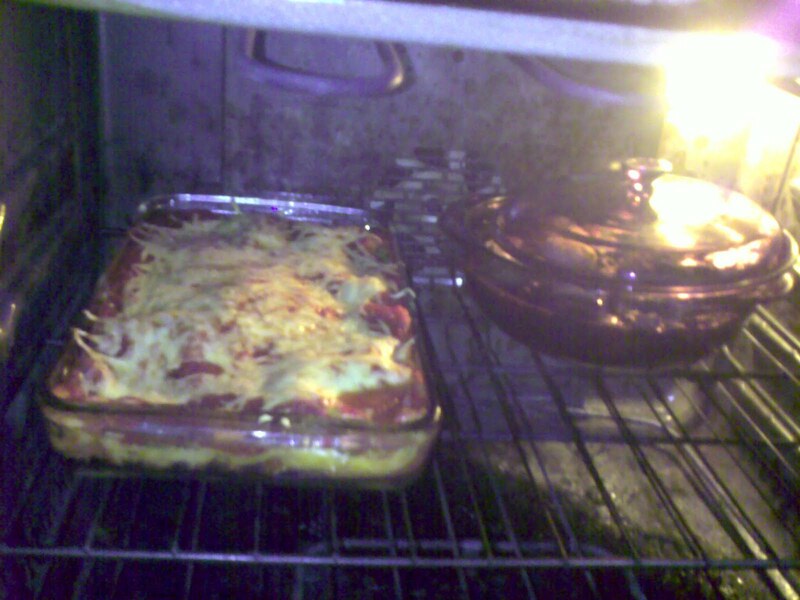 Here is my very dirty oven with lasagne and coq au vin in it. The lasagne I made a little more special with a layer of chopped kale in it. 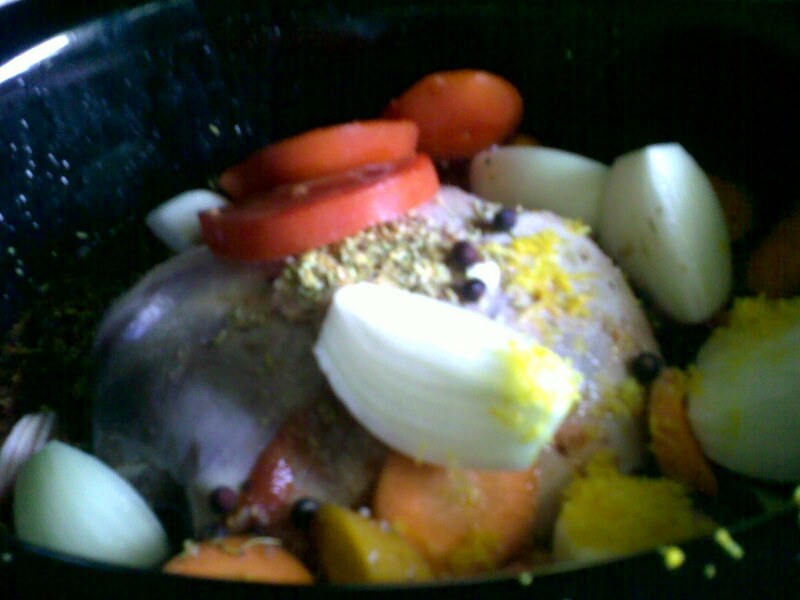 I looked back in my blog and was pretty shocked to see that I hadn’t put in the recipe for coq au vin. I normally just bung everything in the slowcooker but I knew the oven was going to be on for awhile so I put it in a casserole instead. Traditionally, you coat the chicken in flour and brown but…I’m too lazy and noone complains. Chop four pieces of bacon and brown in a fry pan. Drain and put in a casserole (or slowcooker) with six chicken thighs, six pearl onions (if you don’t have them just put big chunks of onion in the pot), 1/4 cup of tomato paste, 2 garlic cloves (minced), 2 cups of chicken stock, 1 1/2 cups of red wine, 1 tsp of thyme, 2 bay leaves and 3/4 cup of button mushrooms. Let simmer away until chicken is cooked through and sauce has thickened. I couldn’t let my slowcooker be lonely so I took a boneless shoulder of lamb and all the ingredients for osso bucco. 1) Tofu marinated in; coconut milk, soy sauce, hot sauce and a bit of sesame oil. This should make quite a nice stirfry tomorrow night. 2) I also made-up a big batch of pesto from all the plants in the garden; pine nuts, shredded parmesan and LOTS of garlic. Whir it all up in the cuisinart and thicken with a bit of olive oil drizzled in. 3) I made some egg muffins with thick-cut bacon and fat organic eggs. This should help curb my compulsion to stop somewhere in the morning on the way to work. 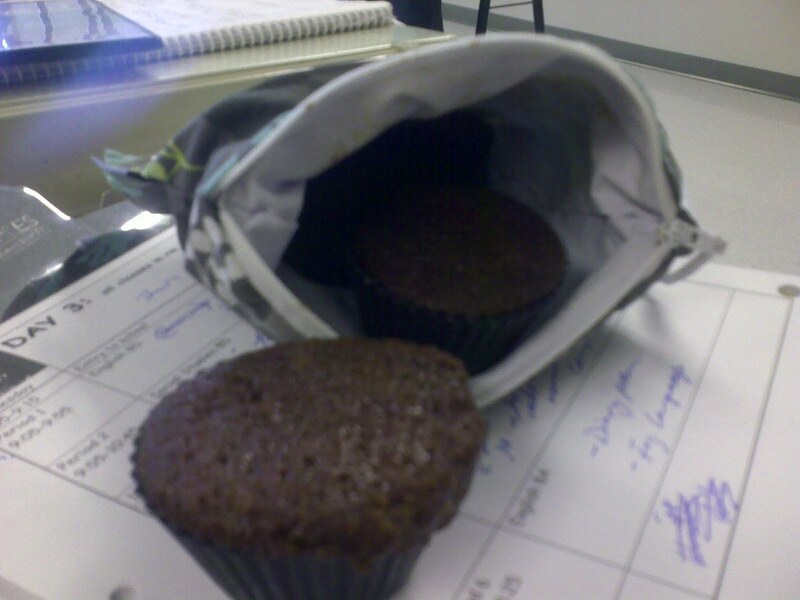 Our baked goods for the week will be these nice gingerbread muffins. Preheat your oven to 350 degrees F. Grease and flour your muffin tin, or use paper or foil liners. Sift together the flour, baking soda, salt, ginger, cinnamon, allspice and cloves. In a bowl beat together the butter and brown sugar until smooth and fluffy. Add the eggs, one at a time, beating after each one. Then beat in the molasses. Add the dry ingredients in two increments alternating with the buttermilk and vanilla. Beat until smooth. Fold in the nuts and raisins. Fill the muffin tin with a large spoon or ice cream scoop in equal parts. Bake for around 20 minutes until the center of the muffin feels firm and springs back when you touch it.